The imposing Touch Screen Orbus XT4000 Elliptical Cross Trainer provides premier level quality and is a true diamond in the Orbus elliptical range. Not only is the XT4000 visually impressive, with its scale and build quality, its technical capability is also without question. 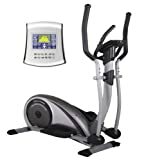 The XT4000 has been developed to be one of the most impressive home use machines on the market, and it rightly is considered amongst the best value Ellipticals available today. With a 10kg flywheel, and its dynamic ‘Touch-Screen’ technology, it is a strong contender against any level of competition and is suitable for the novice through to a true fitness enthusiast. Convenience is guaranteed with express ground floor delivery. . NOTE Delivery of this product is restricted to UK Mainland postcodes only and excludes Northern Ireland, Scottish Highlands and all Offshore Islands. If in doubt, please ask.Some assembly required.